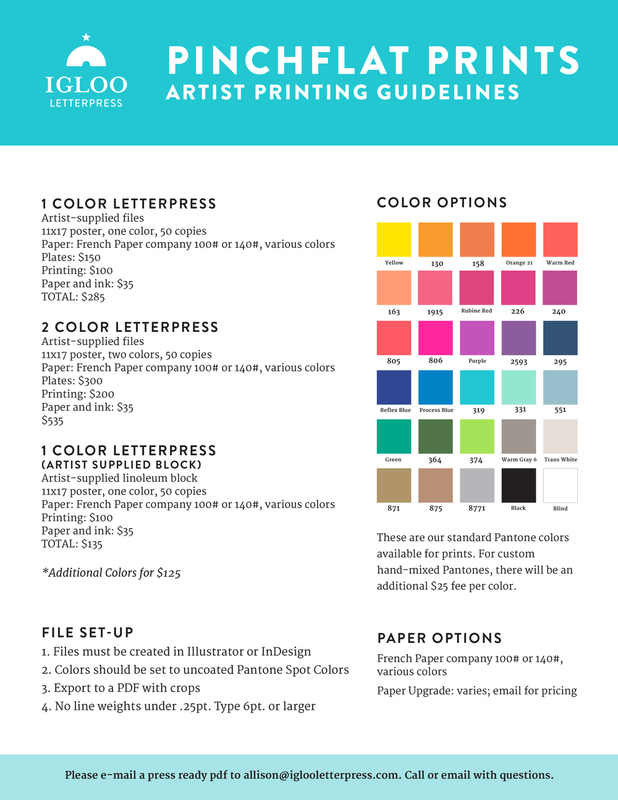 Submissions are rolling in and artists are looking to start the printing process, we have a few tips to help you out. Second, select a printer. We have supplied you with two awesome local printers and two out-of-town options (just in case). Shout Out Loud Prints is a local screen print show located by Grandview Ave. and SR-33. They do great work with a quick turnaround. They can also do apparel and band merchandise. Check out their Poster Price Chart for more information. Igloo Letterpress is a local letterpress shop in Worthington. They do remarkable print work and offer a great selection of paper and custom work. They are also looking to expand! Check out their Kicker Starter Page and help spread the art-loving word. And of course if you have questions, give a good hard think, and if you still cannot figure it out, CONTACT the Pinchflat Team.